In order to stay positioned for continuous growth, McLarens Containers Ltd., an ISO 9001:2015 Quality Management System certified company, implemented FiNAC’ s Container Management System solution from Datamation Systems Ltd., specially designed for the container depot industry. The company invested in a customised ERP solution to manage and support its unique business needs. McLarens Containers, established in 1979, is an inland container depot, which is over 38 years in existence and has grown to provide a wide range of logistics services such as warehousing, cargo lashing, project cargo handling, container freight station, container transport, container rigging, container trading, and container conversions. It also specialises in M&R services, pre-trip inspection facilities for reefer containers, ISO tank container cleaning, periodic tests and minor repairs. Professional and technically qualified logistics industry personnel represent the management team, while a number of Institute of International Container Lessors (IICL-USA) Certified and ISO tank trained personnel make up the balance operational areas. FiNAC is taking McLarens’ container yard operation to the next level, by replacing its weighty manual processes and consolidating multiple processes with a seamlessly integrated solution. The impact of FiNAC was directly experienced throughout the enterprise, improving efficiencies in the yard as well as the back office. 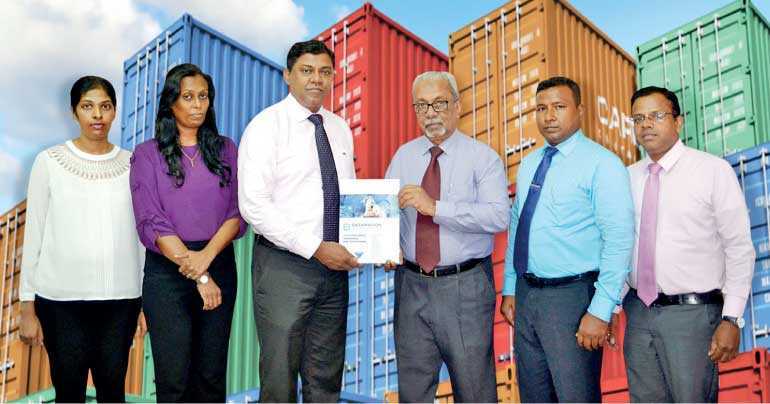 McLarens Containers Finance Director Gisantha De Silva explained how the company’s custom-made legacy systems functioned in an isolated manner, resulting in duplication of work. It was time for McLarens Containers to update its methodology for running its business and become more current with technology. The McLarens Containers partnership with Datamation Systems is part of a companywide process improvement initiative, to adopt new technologies and best business practices, to help increase efficiencies and improve the overall management of the company. The flexibility of FiNAC allows McLarens Containers to be more agile and proactive so as to keep them competitive in the Container Depot industry. Datamation’s FiNAC Container Management System is customised to match the unique and fast-paced environment of depot operations, from the gate-in, to the repair cycle and through the back office process. FiNAC is a dynamic system of customised modules that work together to effectively support and maximise productivity on the ground and in the office. A robust maintenance and repair module is combined with the gate management process, providing real time connectivity and seamless processing of electronic work orders. This powerful solution is enhanced by a flexible mobile application that allows users to connect from a wide variety of internet enabled devices including smart phones and tablets. All of the modules including customer booking, billing, inventory control and EDI processing support each other and are fully integrated. A specially designed web interface for shipping lines, assisting with the estimates and approvals is another feature which is unique to this solution. Datamation Systems Ltd. has been successfully providing business solutions since 1986. They are a software development firm with a mission of providing innovative services and solutions, and a vision of serving clients locally and across the globe. With an experience of catering to more than 25 vertical markets, with over 6 million man hours of pure ERP experience , over 400 satisfied clients and 1200 modules successfully implemented across 3 countries, FiNAC is now ready to serve your business needs.